Objective Treatments with sequential therapy (SEQ) or bismuth quadruple (QUAD) therapy have been proposed as empirical firstline regimens for Helicobacter pylori. We compared the efficacy and tolerability of 10 day SEQ with 10 day modified QUAD as both firstline and secondline treatments for H pylori in a randomised crossover study. Design H pylori positive and treatment naïve patients were randomly assigned to receive either 10 day SEQ (esomeprazole for 10 days, amoxicillin for an initial 5 days, followed by clarithromycin and metronidazole for a subsequent 5 days) or modified QUAD (esomeprazole, bismuth subcitrate, tetracycline and metronidazole). H pylori eradication was confirmed by urea breath test at 8 weeks. Patients who failed the initial assigned treatment were crossed over to receive the alternate regimen. The primary outcome was eradication rates of firstline treatment by intention to treat (ITT) and per protocol (PP) analyses. Results 357 patients were randomised to receive either SEQ or QUAD. The PP eradication rates of the SEQ and QUAD groups were 95.2% and 98.8%, respectively (p=0.10). Based on ITT analysis, the corresponding eradication rates were 89.4% and 92.7%, respectively (p=0.36). Eight (4.8%) patients in the SEQ and two (1.2%) patients in the QUAD who failed the firstline treatment were crossed over to the alternate regimen with 100% retreatment success. The overall incidence of adverse events was higher in the QUAD (16.7%) than in the SEQ (8.1%; p=0.032) group. Conclusions Ten day sequential and modified bismuth quadruple therapies are both highly effective as empirical firstline therapies for H pylori in Chinese patients. The success rate of the current clarithromycin containing triple therapy has declined substantially due to increasing antimicrobial resistance. Alternative regimens, including bismuth containing quadruple therapy or non-bismuth containing quadruple therapy (either sequential or concomitant), have been recommended as firstline therapies by the latest Maastricht Consensus, particularly in areas with a high prevalence of clarithromycin resistance. There is no direct comparison of these two alternative regimens as firstline treatments for Helicobacter pylori. Both 10 day modified bismuth quadruple and 10 day sequential therapies were found to have a very high eradication rate (>95% by per protocol analysis) when used a firstline treatment for H pylori in Hong Kong Chinese patients. Patients who failed the initial assigned treatment (either sequential or bismuth quadruple) were all successfully eradicated when crossed over to the alternative regimen empirically without the need for antimicrobial testing. Both 10 day modified bismuth quadruple and 10 day sequential therapy can be recommended as empirical firstline treatment for H pylori in Hong Kong. Crossover treatment between modified bismuth quadruple and sequential therapy appears to be an effective empirical secondline therapy when firstline therapy fails. In response to the falling H pylori eradication rate due to rising clarithromycin resistance, several regimens, including sequential therapy, concomitant therapy, hybrid therapy and levofloxacin containing therapy, have been studied with variable success.15–18 The latest Maastricht IV Consensus Report recommended using bismuth containing quadruple therapy or sequential therapy as an alternative empirical firstline treatment, particularly in areas with high clarithromycin resistance.7 However, there are no direct comparisons between bismuth containing quadruple therapy and sequential therapy as firstline treatment for H pylori. The aim of this study was to compare the eradication success rates of 10 day sequential therapy (SEQ) with a modified 10 day bismuth containing quadruple therapy (QUAD) as an empirical firstline treatment for H pylori in Hong Kong Chinese patients with a background of rising clarithromycin resistance. We further determined the role of these two regimens as empirical secondline therapy in patients who failed the initial assigned regimen in a crossover design. This was a prospective, open label, randomised, crossover study performed in the Department of Medicine, Queen Mary Hospital, Hong Kong. Eligible patients were recruited from patients who were referred to our department for evaluation of dyspeptic symptoms by upper gastrointestinal endoscopy between July 2011 and June 2012. All patients would have undergone upper gastrointestinal endoscopy prior to recruitment into the study. Patients were eligible if they were aged 18 years or older and had confirmed H pylori infection. H pylori infection was diagnosed by either a positive rapid urease test or positive identification of H pylori in a histological sample using haematoxylin and eosin and/or Giemsa stain. Patients were excluded if they had any of the followings: previous eradication therapy for H pylori; known allergies to any of the study medications; recent use of antibiotics, bismuth salts, probiotic preparations, proton pump inhibitors or non-steroidal anti-inflammatory drugs in the preceding 1 month; pregnant or lactating women; previous gastric surgery; alcohol or drug abuse; or severe concurrent medical illnesses, such as liver failure, renal failure or terminal malignancy. All patients provided written informed consent for participation in the study. The study protocol was approved by the institutional review board of the University of Hong Kong/Hospital Authority Hong Kong West Cluster. Eligible patients were randomised in a 1:1 ratio to receive either 10 day SEQ or 10 day QUAD. Sequential therapy consisted of esomeprazole 20 mg twice daily and amoxicillin 1 g twice daily for the first 5 days, followed by esomeprazole 20 mg twice daily, clarithromycin 500 mg twice daily and metronidazole 400 mg four times daily for the subsequent 5 days. Quadruple therapy comprised esomeprazole 20 mg twice daily, bismuth subcitrate 120 mg four times daily, tetracycline 500 mg four times daily and metronidazole 400 mg four times daily for a total of 10 days. We used computer generated random sequences in blocks of four. All randomisation codes were put into sealed opaque envelopes and kept by an independent research assistant. After obtaining informed consent, the investigators would call the independent research assistant to open the envelope for the allocated regimen for that patient. Written instructions were provided to all patients on how to take the study medications and their common side effects to reinforce drug compliance. All adverse events were recorded in a specific questionnaire by the research personnel. Drug compliance was evaluated by counting the number of unused study medications, and non-compliance was defined as failure to take 90% of the study medications. Patients who failed the initial assigned eradication regimen, as defined by a persistent positive UBT at the end of 8 weeks, were crossed over to receive the alternate treatment regimen. Patients who failed SEQ were given QUAD, and those who failed QUAD were given SEQ as secondline therapy. A second UBT were performed at 8 weeks after completion of the second regimen. The primary outcome of this study was the H pylori eradication rates of the initial assigned treatment by intention to treat (ITT) and per protocol (PP) analyses. The secondary outcomes were H pylori eradication rates in the crossover treatment, the frequency of adverse events and treatment compliance. We estimated the sample size of this study based on two recent meta-analyses on H pylori eradication studies.15 ,20 We assumed the eradication rate of the SEQ group to be superior to the QUAD group, and the eradication rates of the SEQ group and QUAD group to be 90% and 78%, respectively. With a power of 80% and a two sided type 1 error of 5%, 150 patients were needed for each treatment arm that would also allow for 10% loss to follow-up. Efficacy of H pylori eradication was compared by both ITT and PP analyses. All randomised patients were included in the ITT analysis. Patients who did not return for UBT were treated as treatment failures in the ITT analysis. Patients who violated the study protocol or were non-compliant with the assigned treatment were excluded from the PP analysis. A modified ITT analysis was performed to include all patients who returned for follow-up UBT, irrespective of whether the assigned treatment was completed. Continuous variables were expressed as mean (SD) and compared by Student's t test. Categorical data comparisons were performed by Pearson's χ2 test or Fisher's exact test where appropriate. A two sided p value of <0.05 was considered statistically significant. All statistical analysis was performed by SPSS V.20.0 software for Windows (SPSS Inc, Chicago, Illinois, USA). A total of 423 patients were screened within the 12 month study period and 66 were not recruited for various reasons, as listed in figure 1. A total of 357 H pylori infected patients were recruited: 179 patients were assigned to the SEQ group and 178 patients were assigned to the QUAD group. All patients had undergone upper gastrointestinal endoscopy with H pylori infection confirmed. Baseline characteristics and endoscopy findings of the two groups are shown in table 1. There were more women (56.6%) than men in this study, and mean age of the patients was 56.4 years. There was no significant difference in baseline demographics or endoscopy findings between the two groups. Thirteen (7.3%) patients in the SEQ group and 15 (8.4%) patients in the QUAD group did not complete the study. The details are listed in figure 1. Trial profile. ITT, intention to treat; PP, per protocol; QUAD, modified quadruple therapy; SEQ, sequential therapy; UBT, urea breath test. The overall eradication rates by ITT and PP analysis are summarised in table 2. Based on ITT analysis, eradication rates in the SEQ group were 89.4% (95% CI 84% to 93.1%), and 92.7% (95% CI 87.9% to 95.7%) in the QUAD group (difference=−3.3%, 95% CI −9.5% to 2.8%; p=0.36). By PP analysis, the respective eradication rates in the SEQ and QUAD groups were 95.2% (95% CI 90.8% to 97.5%) and 98.8% (95% CI 95.6% to 99.7%); the difference was −3.6% (95% CI −8.0% to 0.3%; p=0.10). We further performed a modified ITT analysis, which included all patients who returned for follow-up UBT. Based on this modified ITT analysis, the eradication rates in the SEQ and QUAD groups were 94.7% (95% CI 90.2% to 91.7%) and 98.8% (95% CI 95.7% to 99.7%); The difference was −4.1% (95% CI −9.1% to 0.03%; p=0.06). Subgroup analysis was also performed to determine the eradication rates in patients with and without gastroduodenal ulcers. The results are listed in table 3. There was no significant difference in eradication rates between the QUAD and SEQ groups in patients with or without gastroduodenal ulcers. Ten patients who failed H pylori eradication after completing the initial assigned treatment regimen were available for crossover treatment by the alternate regimen. Eight patients in the SEQ group were given secondline treatment with QUAD and two patients in the QUAD group were offered SEQ. All 10 patients had a negative UBT result 8 weeks after the second course of treatment. When combining the analysis of both firstline and secondline treatments, the PP eradication rate of H pylori by SEQ was 95.2% (95% CI 90.5% to 97.8%) and by QUAD was 98.8% (95% CI 95.4% to 99.8%). The difference was −3.6% (95% CI −8.4% to 0.7%; p=0.06), which was not statistically significant. The compliance rate of the study patients was 92.7% and 91.6% in the SEQ and QUAD groups, respectively (difference=1.1%, 95% CI −0.55% to 1.96%; p=0.68). The frequencies of adverse events in this study are listed in table 4. Overall, there were significantly more adverse events in the QUAD group (16.7%) than in the SEQ group (8.1%; p=0.032). The most common adverse events reported in the QUAD group were nausea (3.4%), vomiting (2.3%) and skin rash (2.3%). In the SEQ group, skin rash (2.3%) and taste disturbance (1.7%) were the most commonly reported adverse effects. All reported side effects were mild and resolved spontaneously after stopping treatment. We further determined the potential risk factors associated with failed eradication by binary logistic regression. However, none of the factors, including patient age, gender, alcohol and smoking status, presence of gastrodudoenal ulcer, presence of adverse effects and treatment assignment, was associated with eradication failure. In this study, we also determined the role of sequential therapy or bismuth quadruple therapy as secondline treatment for patients who failed the assigned firstline treatment. With the high success rate of both regimens as firstline therapy, only 10 (2.8%) patients were available for this crossover study. All 10 patients had H pylori eradicated after the alternative regimen. With the minimal overlap of antibiotics of the two regimens, patients who fail the initially assigned treatment could be conveniently allocated to the alternative treatment without the need for antibiotics susceptibility testing, which are not widely available. The combination of sequential therapy and bismuth quadruple therapy, in either order, may prove to be a very useful approach to firstline and secondline H pylori therapy in our daily practices. In this study, the QUAD group had a statistically significant higher incidence of adverse events compared with the SEQ group, which was not unexpected. The reported adverse events of both QUAD and SEQ therapies were however usually mild and self-limiting, and did not have a major impact on the compliance of this study. Our study has several limitations. First, pretreatment antimicrobial resistance of H pylori was not tested. The antimicrobial resistance profiles of our patients were only based on recent local data, and the results would definitely be beneficial if data on antimicrobial resistance were also available. Second, we used only one positive test result for diagnosis of H pylori infection in this study. As false positive biopsy based H pylori testing is infrequent, this may have an impact on patient recruitment but should not interfere with the estimation of the success rate of the eradication regimens. Third, the present study was set up as a superiority trial based on the results of previous studies suggesting that the eradication rates of the SEQ regimen were higher than those of the QUAD regimen. This assumption and sample size estimation were based on two recently published meta-analyses,15 ,20 which may be subject to flaws. In particular, the eradication rates of bismuth quadruple therapy as reported20 might underestimate the eradication rate of bismuth quadruple therapy. An earlier meta-analysis29 reported a much higher eradication rate of quadruple therapy (more than 85%) if it contained omeprazole and was given for 10–14 days. We found that both regimens were highly effective, with a more than 95% eradication rate based on PP analysis, and QUAD therapy appeared to have a higher success rate than SEQ therapy. Given the excellent eradication rates of both treatment arms (>95% according to PP analysis), demonstration of a statistically significant difference would require a very large sample size and may not confer any additional impact on our daily practices. Fourth, due to the small number of patients who failed H pylori eradication, the current crossover design for assessment of the success rate of secondline therapy was under powered. With the very high success rate of the current two regimens, a multicentre study will be needed to compare these two regimens as secondline therapies. On the other hand, it demonstrates the possible role of alternating these two regimens empirically in patients who fail the assigned firstline eradication therapy without the need for further antimicrobial resistance testing. Lastly, this study recruited only Chinese patients. Due to the potential differences in CYP2C19 genotypes30 and antimicrobial resistance patterns among different ethnic groups, further studies in other populations may be necessary to confirm our findings. In conclusion, both sequential therapy and modified bismuth containing quadruple therapy were highly effective as firstline therapies in eradicating H pylori in Hong Kong Chinese patients and with a low frequency of adverse events. We would like to thank all of the endoscopists and endoscopy nurses in Queen Mary Hospital for patient recruitment.
. Unidentified curved bacilli on gastric epithelium in active chronic gastritis. Lancet 1983;1:1273.
International Agency for Research on Cancer. Infection with Helicobacter pylori. IARC Monogr Eval Carcinog Risks Hum 1994;61:177–240.
. Helicobacter pylori eradicaiton to prevent gastric cancer in a high-risk region of China: a randomized controlled trial. JAMA 2004;291:187–94.
. Eradication of Helicobacter pylori using one-week triple therapies combining omeprazole with two antimicrobials: the MACH I study. Helicobacter 1996;1:138–44.
. American College of Gastroenterology guideline on the management of Helicobacter pylori infection. Am J Gastroenterol 2007;102:1808–25.
. Second Asia-Pacific consensus guidelines for Helicobacter pylori infection. J Gastroenterol Hepatol 2009;24:1587–600.
. Management of Helicobacter pylori infection—the Maastricht IV/ Florence Consensus Report. Gut 2012;61:646–64.
. Helicobacter pylori treatment in the era of increasing antibiotic resistance. 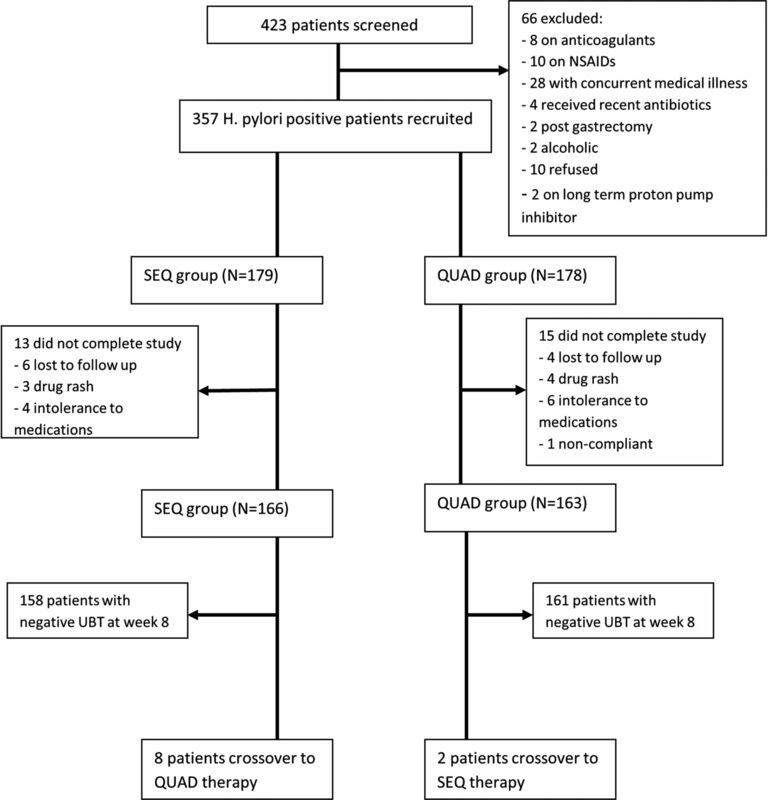 Gut 2010;59:1143–53.
. Ten-day sequential versus triple therapy for Helicobacter pylori eradication: a prospective, open-label, randomized trial. J Gastroenterol Hepatol 2012;27:1675–80.
. Low eradication rate of Helicobacter pylori with triple 7–14 days and quadriple therapy in Turkey. World J Gastroenterol 2004;10:668–71.
. Review article: the treatment of refractory Helicobacter pylori infection. Aliment Pharmacol Ther 2003;17:1333–43.
. Treatment of Helicobacter pylori infection 2012. Helicobacter 2012;17(Suppl 1):36–42.
. The antimicrobial susceptibility of Helicobacter pylori in Hong Kong (1997–2001). Helicobacter 2002;7:327–8.
. Pharmacogenetics of esomeprazole or rabeprazole-based triple therapy in Helicobacter pylori eradication in Hong Kong non-ulcer dyspepsia Chinese subjects. J Clin PharmTher 2010;35:343–50.
. Sequential therapy or triple therapy for Helicobacter pylori infection: systematic review and meta-analysis of randomized controlled trials in adults and children. Am J Gastroenterol 2009;104:3069–79.
. Update on non-bismuth quadruple (concomitant) therapy for eradication of Helicobacter pylori. Clin Exp Gastroenterol 2012;5:23–34.
. Modified sequential Helicobacter pylori therapy: proton pump inhibitor and amoxicillin for 14 days with clarithromycin and metronidazole added as a quadruple (hybrid) therapy for the final 7 days. Helicobacter 2011;16:139–45.
. Should quinolones come first in Helicobacter pylori therapy? Ther Adv Gastroenterol 2011;4:103–14.
. A rapid, low-dose, 13C-urea tablet for the detection of Helicobacter pylori infection before and after treatment. Aliment Pharmacol Ther 2003;17:793–8.
. Empiric quadruple vs. triple therapy for primary treatment of Helicobacter pylori infection: Systematic review and meta-analysis of efficacy and tolerability. Am J Gastroenterol 2010;105:65–73.
. A report card to grade Helicobacter pylori therapy. Helicobacter 2007;12:275–8.
. Bismuth-containing quadruple therapy for Helicobacter pylori: lessons from China. Eur J Gastroenterol Hepatol 2013;25:1134–40.
. Efficacy of bismuth-containing quadruple therapies for clarithromycin-, metronidazole-, and fluoroquinolone-resistant Helicobacter pylori infections in a prospective study. Clin Gastroenterol Hepatol 2013;11:802–7 e1.
. Ten-day sequential therapy is more effective than proton pump inhibitor-based therapy in Korea: a prospective, randomized study. J Gastroenterol Hepatol 2012;27:504–9.
. Levofloxacin-containing triple and sequential therapy or standard sequential therapy as the first line treatment for Helicobacter pylori eradication in China. Helicobacter 2012;17:478–85.
. Sequential versus triple therapy for the first-line treatment of Helicobacter pylori: a multicentre, open-label, randomised trial. Lancet 2013;381:205–13.
. Helicobacter pylori eradication with a capsule containing bismuth subcitrate potassium, metronidazole, and tetracycline given with omeprazole versus clarithromycin-based triple therapy: a randomised, open-label, non-inferiority, phase 3 trial. Lancet 2011;377:905–13.
. Randomised clinical trial comparing sequential and concomitant therapies for Helicobacter pylori eradication in routine clinical practice. Gut 2014;63:244–9.
. Meta-analysis: the efficacy, adverse events and adherence related to first-line anti-Helicobacter pylori quadruple therapies. Aliment Pharmacol Ther 2004;20:1071–82.
. Genetic differences in CYP2C19 single nucloetide polymorphisms among four Asian populations. J Gastroenterol 2001;36:669–72. Contributors KSHL and IFNH: study concept and design, acquisition of the data, statistical analysis, data interpretation and drafting of the manuscript. WKWS, ASJH, FYFL, DYKB and SYW: patient recruitment, acquisition of the data and critical revision of the manuscript. TT: technical support and study coordination. WKL: study supervision, data interpretation, and drafting and critical revision of the manuscript. Funding This study was supported by funding from the Division of Gastroenterology and Hepatology, Department of Medicine, University of Hong Kong. Ethics approval The study was approved by the institutional review board of the University of Hong Kong/Hospital Authority Hong Kong West Cluster.